Back in the fall of 2011 I found myself looking for a netbook-format computer, which I planned use for a combination of basic online, office and media work. Online work covers the usual email, social networking, blogging and surfing duties. Nothing too heavy, I’m not expecting to use this as a media playback machine for video, nor for games. Office-related work for me is the usual emailing, documentating and spreadsheet number-logging and number-crunching work, and the occasional printed letter. Media work is the basic management and non-critical editing of a large photo library, along with occasional audio mastering work. Lacking the funds for the MacBook Air that I would want for such duties, I had to look around at the netbook offerings from the rest of the market. All of them seemed to come with Windows 7 Starter Edition, and all of them seemed to offer the same 3 USB2.0 ports, SD card slot and analoge video output over VGA. Aside from the occasional Nikon RAW photo, nothing of the work I want to do with such a machine is terribly processor-intensive, but I decided that something like the 1.6GHz Intel N570 dual-core Atom processor would give a reasonable compromise between cost, battery life, speed and future-proofing. In fairness, there’s not much user-configuration to do on a Netbook beyond picking the right CPU/battery/storage-space for the job. All the netbooks I found were offered with only 1Gb RAM, which I thought would likely not be enough to get real work done in Windows 7, Starter Edition or not. I could easily see an upgrade to 2Gb on the cards, and was happy to see that all the netooks I found offered easy access to the RAM bays to do this. So – I tried typing on a few machines to see how the keyboard felt, and how responsive each machine was. No point buying a machine which is unable to keep up with my slow typing, from new! Within a few minutes I found myself gravitating to the EeePC line, whose out-of-the-box software was slim enough to not bog the machine down in real use, while having a keyboard I could comfortably type on without feeling like I’m constantly having to “switch modes” from my full-sized work machines, Mac and PC alike. So – The EeePC 1011PX became my weapon of choice – mostly because it was the only machine I felt comfortable with, that also offered a dual-core processor, decent-enough battery and reasonable hard-drive space: 320Gb is a welcome improvement on the 120-160Gb I found in other machines at a similar price-point, and should give me room to spare even with a decent (compressed) music and photo library on board. So – I got the machine home, and started out with everything as it came out of the box. Windows 7 Starter Edition was a welcome modernisation on the Windows XP PC’s I’ve owned in the past. Coming back to the Windows from using Macs for 6 years was rather a shock I’ll admit – of the first 30 hours of real use I’d ended up spending 20 of them waiting for new updates to Windows, Office or other software. Thats not a good ratio, and the updates just never stopped. Absolutely hopeless. When I was able to get real work done, I found the machine was paging to virtual memory on the hard drive pretty much constantly. Given that this only involved use of Google Chrome and/or LibreOffice, none of which for intensive tasks, it was pretty clear that a RAM upgrade was on the cards. Asus says that this machine is capable of 2Gb RAM max, so that’s what I put in it for the princely sum of around £15 from a real bricks-and-mortar store. In Windows 7 the difference between 1Gb and 2Gb RAM was immediate, even under the lightest of use. No, it didn’t improve startup or application load times, but it was nice to finally have a machine that didn’t noticeably bog down over hours of use. Maximum of 3 simultaneous applications. It’s not uncommon for me to have a media player, spreadsheet, word processor and web-browser open alongside each other. Bang – I’m over the limit already. None of these are intensive enough to bog down a Netbook, so this really is a silly arbitary rule that gets in the way unnecessarily. Use of screen space. Again, this was a silly thing, but I found the task-bar taking up too much space for the functionality it gives. Netbooks with small screens need some thought applied to them on the part of developers, so that the content takes up more space than the UI that displays and manipulates it. All the Windows-based software failed this test badly, especially MS Office. I was able to do some things about this like hiding some toolbars, setting the taskbar to auto-hide, but it still didn’t feel right. Typing lag. As the software updates racked up, the machine bogged down. I turned the bundled Anti-Virus software off which helped for a while, but the machine soon bogged down. There’s just no excuse for this kind of behaviour on any machine designed for real users. Wallpaper. Yup – W7 Starter Edition doesn’t even let the user configure their wallpaper. Once booted, the restoration software failed to see the backup image as a valid image, OR would refuse to recognise the machine as a valid installation target. The results were repeatable across a variety of USB flash-drives, USB hard-drives and even DVD media created using an external drive plugged into this machine. So, after wasting two days trying (and failing spectacularly) to get to a point where I was confident that I would be able to reinstall the system software in the event of a failure (which will happen one day), I took the decision to ditch the Windows install and look for something more suitable. Android x86 ports Very, very fast even from SD card.Nice, modern interface, works well on smaller screens.Great battery life. Excellent syncronisation with Google mail, calendars, contacts. Software selection very limited.Getting the machine to sleep needs some hacks.Machine thinks it’s a phone, which means that its software doesn’t know how to interact with local file storage on a hard drive. Too much reliance on a working Internet connection. Too much of a chore to get real work done, stored and sent out. One to watch.Releases 3 and 4 used.I really wanted this to work out – I’m all for “unusual” solutions where they bring real benefits. Ubuntu 11.10 Well-known,All hardware works immediately.Stable. Reasonable use of battery and other limited system resources. Good selection of sofware bundled or in repos. Great online forum community. Unity interface can get slow and glitchy.Gnome Shell nice enough but slow on mobile hardware.Needed time to whittle down the UI to make efficient use of display. KDE too complex/fiddly for daily UI use, especially on small screen. #! – Crunchbang linux Excellent speed.Light on resource.Highly customisable. Good range of software in repos. Great online forum community. Iphone tethering took a lot of work to get running, including compiling a new kernel and some drivers/pairing software.Kernel and some other software running behind the times. Recommended.My favourite out-of-the-box install, let down by driver support on newer hardware. Fedora 16 and 17 Faster than Ubuntu in general use.Great online forum community covering a wide range of uses. Even more resource-heavy than Ubuntu when running comparable desktop/window-managers.UI default settings not good on small screens.Slower bootup than Ubuntu. I loved releases 1-3 back in the day, but I think it’s been surpassed for most” normal” users by Ubuntu. Haiku OS Fabulous speed and use of resources.UI is efficient and great on small displays. Clearly not a “finished” solution.Software and drivers not available. One to watch.I was a fan of BeOS 5 back in the day, and would really like to see its community-driven successor. Joli OS (Jolicloud) Nice presetation of applications.Online syncronisation of apps, settings and content is enticing.Based on Ubuntu. Iphone tethering never worked correctly.Dropbox integration doesn’t produce a local cache.Integration with Google Docs needs a working Internet connection. “Offline” operations are possible but not easy. Application “store” not terribly intuitive. I wanted this to work, but the silliness of having no offline cache or operability with built-in apps made me run away screaming. Chrome OS Similar to Joli OS Hampered the same way as Joli OS.Wasn’t able to try on real hardware as none of the available builds booted on this machine. 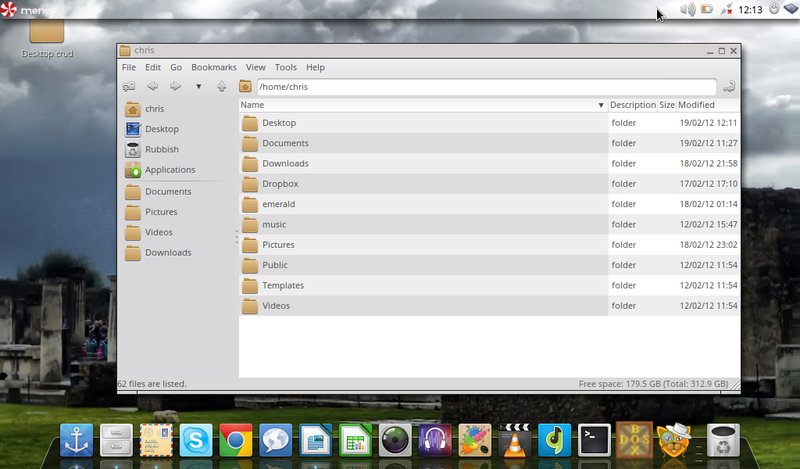 Pear OS Slicker than Ubuntu, slightly quicker to boot. French localisation can’t entirely be turned off.Some rough edges to UI,Some installable software didn’t work correctly One to watch, if it ever takes itself seriously enough to fix the rough edges.Watch out for a lawsuit from Apple – there’s a lot of UI similarities and even straight copies of some elements. Good for Apple-savvy users, perhaps. Peppermint OS Two Almost as quick as Crunchbang, to boot and in use.Quicker in use than Ubuntu.All hardware worked out-of-the-box. Default Openbox config works well on small screens as it comes. Insane battery life compared with box-fresh Ubuntu or Windows 7 installs. Some fiddling required to make it look and operate like a modern OS.Iphone Internet tethering worked, but only after installing ipheth-pair software. The all-round winner in my testing. LibreOffice office suite, with toolbars set to “small” mode. Evolution for email, contacts and calendar management, synchronised to Google account with built-in tools. Dropbox for online document storage/backup. xcompmgr for screen shadow and transparency effects. Docky for Mac-OS-like dock. I’m a sucker for UI niceties, so long as they’re capable of getting out of the way when I’m trying to get real work done. Ipheth-pair utility to get iPhone Internet tethering working. Shotwell for photo library management and basic editing. Audacity for basic sound editing. Gimp for more advanced image processing/editing. Google Chrome browser. It’s built-in bookmarks/app/settings synchronisation has been a genuine lifesaver while I’ve been trying to find the right OS/workspace for this machine, working for everything except Haiku OS and (strangely) Android. Gwibber for basic access to Twitter. Skype for transatlantic voice/video calls. Trackpad – it works, but a little too well during typing, sometimes invoking a click as I tap it accidentally while typing, even when I’ve turned “tap to click” off. Screen colour calibration – I’ve been spoiled by how easy this is to do (by eye) using built-in tools on Mac OS X, and could do with finding a similar method here on Linux. Next Post Headphones in live mixing. and you want your course to be really enjoyable. They provide you the rough estimate for your junk item and car parts according to model you have. You should not need a car title to sell a scrap vehicle. will be the acid test for anything else written now about the Beatles. garden shed is too close to a property line.